Claudia Piñeiro is an Argentinian crime writer. Most of her novels have received prizes. This one is no exception. It received an Argentinian and a German prize. The good news—most of Piñeiro’s novels have been translated. 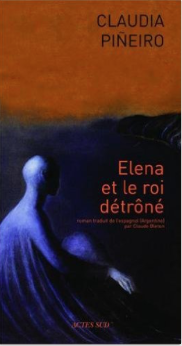 The bad news—for reasons I really don’t get, this is one hasn’t been translated into English, but you can read it either in Spanish Elena sabe, French – Elena et le roi détrôné or German Elena weiss Bescheid. I suppose there are other translations. Ever since I read Piñeiro’s All Yours – Tuya in 2012, I knew I wanted to read more of her novels. Not sure why it took me so long. Two weeks ago, I thought of her again and ordered this one and another one, Thursday Night Widows. 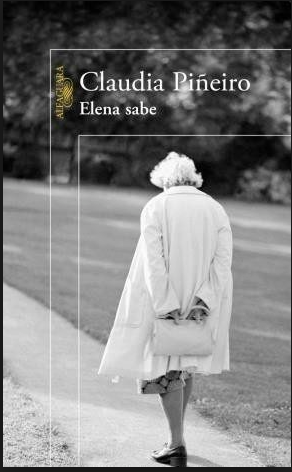 Elena knows tells the story of a woman, Elena, who suffers from Parkinson’s disease. Her daughter, Rita, has been found dead in a belfry. The police have ruled that it was a suicide but Elena cannot accept that. She is sure that Rita was murdered. The book follows two alternating timelines, both from Elena’s point of view. The first is set firmly in the present, while the second timeline tells Elena and Rita’s story in flashbacks up until the suicide/murder. Since the police have stopped the investigation, Elena has decided that she will investigate on her own. Since she suffers from advanced Parkinson’s disease, this is a difficult task. The timeline set in the present follows her on a journey from her apartment to someone else’s apartment. She hasn’t seen this person in twenty years but hopes that she will “lend” her her body and investigate on Elena’s behalf. What a breathtaking story. So well done and with an amazing twist at the end. 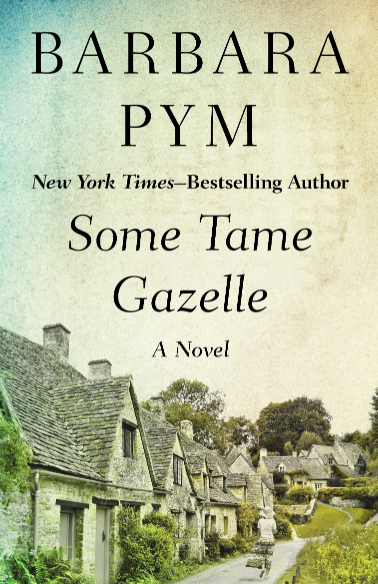 I can’t say I knew a lot about Parkinson’s before reading this novel. I do now. I had no idea how awful this is. Elena’s days are an ordeal. Every single thing needs careful planning. Even the most mundane, routine acts. She cannot lift her head anymore, due to atrophied muscles in the neck. She cannot move, walk, etc, unless she takes tablets that take a certain amount of time to kick in and whose effect dwindles all too quickly. The flash back sections tell us that she lives with Rita, a forty-year-old single woman and that their relationship is one of love and hate. They exchange sentences that feel like the cracking of whips. Needless to say, Rita is the one who takes care of Elena. From what Elena tells the reader, we can deduce that Rita’s disgusted by her mother’s illness. Following Elena on her trip to the other end of the city, is painful to read. But it’s equally painful to read about Rita’s life with her. 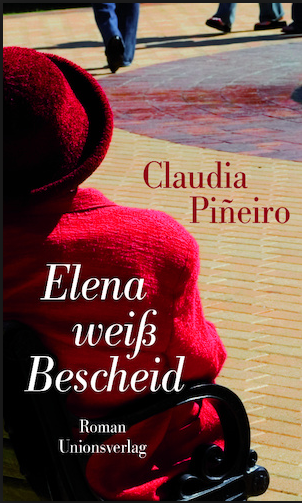 In a novel that is told like a taut crime novel, Claudia Piñeiro explores topics like illness, getting older, the responsibilities of women to take care of the elderly and of kids. She shows us women trapped in situations from which there’s no escaping. The end came as a shock but made perfect sense. This is an outstanding novel. Sharp, taut, and unsparing. Highly recommended. She is such an interesting writer, isn’t she? No book is the same, there is always a dark undercurrent, and it seems to be about much more than is immediately apparent. I wonder if the reason this book hasn’t been translated into English is because so far she has been sold to the English-speaking world as a crime writer, and this doesn’t fit so comfortably into that labelled drawer. Very interesting. I can hardly wait to read the next one. Yes – that’s exactly what I thought. I didn’t mention that because I thought knowing that might spoil the book. Good crime novels are always so hard to come by. Thanks for the suggestion. I agree. Piñeiro is a very literary crime writer. Not a classic one at all. All Yours is terrific. This one too, of course, but, as Marina says, it’s less crime than others. The combination of a crime novel with an account of what someone goes through who suffers from Parkinson’s disease sounds unusual. Piñeiro sounds like a very out of the box writer. It seems very worthwhile to illustrate what folks with this malady go through. I can tell you it was enlightening. I had no idea. Or that there were different firms and that without the shaking it’s worse. It made so sad. She is an unusual writer. Very profound. This probably hasn’t been translated yet, has it? It hasn’t. And, like Marina said, it might never be as it’s far less a crie novel than the others. It sounds excellent, Caroline. Shame it hasn’t been translated yet, but hopefully that will change in the future. I have Thursday Night Windows and hope to read it later this year, possibly for Richard’s Argentinian lit event if it runs again in the autumn. It is excellent. I don’t think I’ll wait that long until I read Thursday Night Widows. I’ll be interested to hear your thoughts. Wonderful review, Caroline! I haven’t heard of Pinero before. I haven’t read many Argentinean writers and so would love to try this. Parkinson’s is really bad. Nice to know that this book sheds a lot of light on it. I can’t wait to find out what the surprise ending is. I am glad that non-english authors keep writing genre defying books like this. Thanks, Vishy. I’m very glad as well and found that I’m in the mood to return to my roots so to speak. Before the blog I read at least 60% non-English books. Maybe more. I hope you’ll gve her a chnace, some day. A lot has been translated. Oh, this sounds really good, Caroline. I met a woman whose husband had Parkinson’s and he couldn’t do anything at all. I felt so sorry for both of them. It’s a horrible disease. Now I want to look for this author’s other novels, as it’s been a long time since I read anything in French. I had no idea how horrible it is. I’m not one to google illnesses when I don’t know anybody who has them. It’s really sad. I’m sure you will like her because she’s a very subtle stylist and even in translation – I read the German – the voice is strong. A new name for me as well – this sounds great, really interesting how she’s structured it. Off to see which of hers are available in English. Thanks! She’s worth tracking down. I think pretty much most of her novels are available in English. My pleasure. Of course, looking back I now see I commented on Guy’s Piniero reviews. Oh well. Who can keep track?? Thanks due to both – she’s on the wishlist now. I know. It happens to me as well. 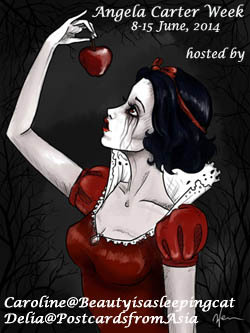 I’ve read: Thursday Night Widows, Betty Boo, A Crack in the Wall and All Yours. I think I can remember your review of Thursday Night Widows. That will be my next. It seems you like her a lot as well. The film is a disappointment. I’ve only read Thursday Night Widows by Piñeiro (review at mine and at Guy’s), which was enough to convince me she’s a definite talent. I’ll look out for this when it gets an English translation since it sounds excellent. One of my favourite films of recent years was a Korean neo-noir called Mother. It’s about a woman with dementia who sets out to clear the name of her mentally handicapped son after he gets arrested for murdering a local school girl. In classic noir style she soon discovers secrets the town would rather leave forgotten. It’s actually very, very good not least because of the difficulty of having a protagonist who is elderly, frail and only intermittently mentally competent. I’m sure you can see why I was reminded of it. It’s not as bleak as it sounds by the way, though being noir it’s still fairly bleak. I’m so glad you mention “Mother” I had it on my wish list for years but when I went through the titles recently, I didn’t know why I put it there anymore and deleted it. Now I know.Definitely a film, I’d like to watch and there’s a smiliarity, although this one’s not noir at all. Thursday Night Widows will be next, so I’ll make sure to read your review then. My introduction to Pineiro’s work was the Thursday Night Widows which is really excellent so you are in for a treat! Like you I keep meaning to read more (I think I have at least two other unread books by her) I just have not yet gotten around to picking up another of her books. She’s really good, isn’t she? Too bad this one has not yet been translated, but maybe it will be eventually. I need to pick up another of her books soon! I can’t really say what’s so great about her. She’s very unique.